Bright Lights are shining in the Villas at Ashlake this Holiday Season! Cornerstone Homes is offering 5 quick move-in homes with savings up to $17,500, because we can’t wait to share the magic with you! There is still time in 2018 to make the lifestyle change you deserve. In the Villas at Ashlake, your days will be spent doing only what you love. Because we’re in charge of your home’s maintenance and repairs, you can finally sit back, relax, and enjoy every moment of your brand new vacation-inspired life. Whether you’re retired or on your way, every day feels like Christmas at the Villas at Ashlake. No more stairs, no more having too much space to clean, and no more yard work. Say hello to a brand new shiny, energy-efficient home with all the bells & whistles you’ve been dreaming of! Finally, you’ll have time on your hands to meet new neighbors and enjoy fun social activities at your clubhouse, exercise in your fitness center, pick fresh veggies in your community garden, or walk the sidewalks when the weather starts to warm up. In other words…. Time to enjoy life!!! These award-winning, popular homes are waiting for you, so come see us today! The #1 phrase that we hear over and over from our homeowners is “Why did I wait so long?” When you visit our community, you can ask them yourself! They will be glad to tell you how great life is at the Villas at Ashlake. 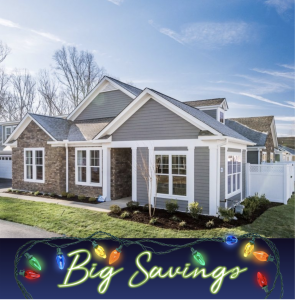 There’s no greater gift to give yourself than the happiness of home… For more information on our holiday savings, please visit our website or contact Lori Melton at 804-234-8525 or lmelton@cornerstonehomes.net. From all of us at Cornerstone Homes, Happy Holidays to you! Quick Move-In Homes: SOLD! The Colonnade** 2 BR, 2 BA, 1,547 sq. ft. | $320,442 (save $15,500) SOLD! The Canterbury** 2 BR, 2 BA, 1,905 sq. ft. | $337,203 (save $17,500) SOLD! The Canterbury w/ Bonus** 3 BR, 3 BA, 2,495 sq. ft. | $350,260 (save $16,500) The Canterbury** 2 BR, 2 BA, 1,905 sq. ft. | $323,840 (save $14,500) The Ducal** 2 BR, 2 BA, 1,806 sq. ft. | $332,779 (save $11,500) *Savings based on price comparison of completed Quick Delivery homes that include upgrades and base price of To-Be-Built homes with no options/upgrades. **Must close before year-end.